His fans and the press make him sound a lot more threatening than he is. Dmitry Tursunov: It depends. If everyone talks about Roger as being the greatest, then you come out on the court against him feeling a little threatened. So you start making a little bit of mistakes that you normally don’t do. So I think a lot of it sort of happens in your head. You think to yourself a little bit, you force yourself to play too good for your own level. And if you get used to playing him, then you start playing a little bit within yourself and usually that’s the best chance for you to do your best. It doesn’t matter who you’re playing, if you’re trying to force yourself to play outside of your comfort zone, you’re always going to make mistakes, whether it’s against Roger or my grandmother, it doesn’t matter. What was your most memorable match with him? Tursunov: I’ve played three matches against him. I’ve lost all three of them. In one of them, I did take a set off of him. My last match against him was in the Olympics. I kind of defeated myself there in that final set. I was so nervous playing him that I made a lot of mistakes and all he had to do was show up. Again, I’m not trying to downsize Roger and he doesn’t need downsizing. I don’t think it’s necessary to bring him up to like a deity level of a player. He’s not. He can be defeated and Rafa has proved it. Rafa doesn’t get affected by that. Mentally, he’s very disciplined. He’s able to just play his game pattern regardless of who he’s playing. He could be playing you, me, Roger, he doesn’t care. If Jesus comes down and starts floating on the court, he still plays the way he’s playing. And that’s why he’s able to defeat Roger, in large part. There’s a lot of other things. It’s not like Rafa doesn’t have any weapons. 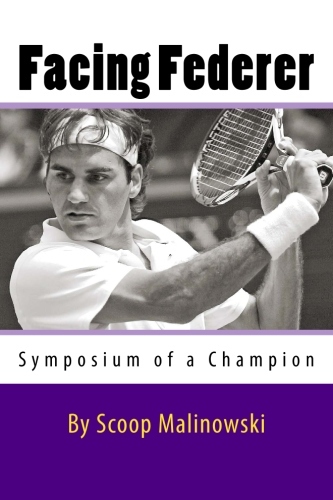 My point is, a lot of defeats against Roger happen psychologically. Players force themselves to step out of their comfort zone and they start making mistakes. It’s like going out on a date with a really hot girl. You’re probably going to try to make stupid jokes and then you’re going to feel like an idiot after that. That’s kind of how it feels. Just to sum it up [smiles]. Your lasting memory of Roger on the court or off the court? An anecdote? Tursunov: Well, he can’t. He’s got an image to uphold. So he can’t do anything less than, you know, like his hair is glowing. Is Roger very hard for you to play against? Gilles Muller: Of course. He’s one of the greatest of all time, if not the greatest. And obviously he’s a very good player. To be honest, I prefer to play him than to play Nadal, for example, or Djokovic. Because they make you suffer on the court. They make you physically suffer on the court. And Roger’s more the guy who hits winners. So it’s not as hard physically to play him. That’s what I felt. Of course, in tennis, of what he’s able to do with the ball–it’s just amazing." What is your most memorable match with Roger? Gilles Muller: The one I remember the most is the one at the U.S. Open when I lost in three close sets in quarterfinals. The first time I played him was pretty amazing too. I played him the first time in Indian Wells. That was back in 2005. And he had his long hair [laughs]. That was a pretty nice moment also because it was only my first year at the high level playing the big tournaments. So that was a nice moment. I like to remember the time we played at the U.S. Open because that was a close match, at least close to winning one set. So far, I’ve never won a set against him. So I was very close there. How are your relations with Roger off the court? Gilles Muller: Well, he’s very laid back. I mean, he’s always friendly to everybody, so that makes him special. Because you have a lot of those guys you barely see and they barely talk to you. And that’s probably also because we speak the same language. He speaks French-German like me too, so it’s easy to communicate with him. He’s a pretty nice person. He’s laid back. You don’t feel like he’s mad at stuff all the time. He seems like … I’ve never seen him in a bad mood. That makes him a pretty good person I think. Can you share a lasting memory on or off the court, maybe a conversation or an anecdote? Gilles Muller: I spoke to him the day before we played in the quarterfinals at the U.S. Open. And I was just surprised. Because, for me, it was the first time I was at that stage in the tournament. All the press work with all the interviews and everything. And because I’m coming from a country where they’re not traveling to the tournaments so I have to make calls all the time and speak and give interviews in three or four different languages. So that’s always tough for me. At that point, that was the first time that happened to me, so it was very tough for me. On the other hand, I just saw him and he was doing the same thing. And I guess he was doing that every day. I was just asking how he does it. It was pretty nice to speak with him. I mean, he could have not answered to me, because we played each other the next day. I think there’s a couple of guys who would not like to do that—speak to the guy or be nice to the guy you play the next day. But he was just very relaxed and he told me, ‘Yeah, you get used to that. And it’s tough, but …’ But it was nice. It was a nice memory. Your first memory of Roger Federer? Gilles Muller: I think … I can’t remember against just who he was playing, but I’m pretty sure it was at the Basel tournament and I watched it on TV. And everybody was talking about this Federer guy being the next number one and being a very good junior. And I just remember that the racquet flew everywhere on the court [laughs]. He threw his racquet like almost every point he lost. And then people said that’s one of his problems, he used to be crazy on the court, and very emotional. It’s amazing how he developed in that manner. He’s so calm on the court now, you barely see him say a word on the court now. That was pretty funny. I remember watching that match. I can’t remember who he played but the guy hit a winner against him and he just threw the racquet from the baseline to his bag. I thought that was pretty funny because when you see him now he’s a totally different person. What was your most memorable match against Federer? Dominik Hrbaty: Probably in Cincinnati when I beat him as the number one in the world. But there was also one match in Wimbledon, our last meeting. I didn’t play well because it was after my surgery, and this was the only time that he beat me … I beat him two times before. We were very good friends, and he was always joking about when he was going to beat me. And in Wimbledon, we sat on the bench together, which is very unusual. On the last changeover, I came over and sat with him and told him, “Roger, finally you beat me. So this is the day.” And we had a good laugh. It’s not only about competition, sports and tennis is about friendship and also about making memories that you will remember for the rest of your life. Any final comments on Roger? Dominik Hrbaty: Roger is different. He’s the new generation. He was comparable to Marcelo Rios, very talented, and with great hands. But the difference was Roger had the big serve and big return. He could make winners out of anything basically. And even out of defense. Roger is just one of a kind. It’s always a special feeling to play Roger or any number one in the world. Because he’s the best player in the world and you want to be at your best. If you can beat him, you become a part of the history of tennis. Because you don’t often meet a number one in the world. And if you beat him, everybody says ‘Wow, congratulations.’ You make the news. All your friends suddenly text you. It’s just such a good feeling. Also you can do it for yourself because you can prove that your own brand of tennis can play against the top player in the world. And this is the point of tennis. If you can prove, not only to yourself, but also to others that you can really play at the top.